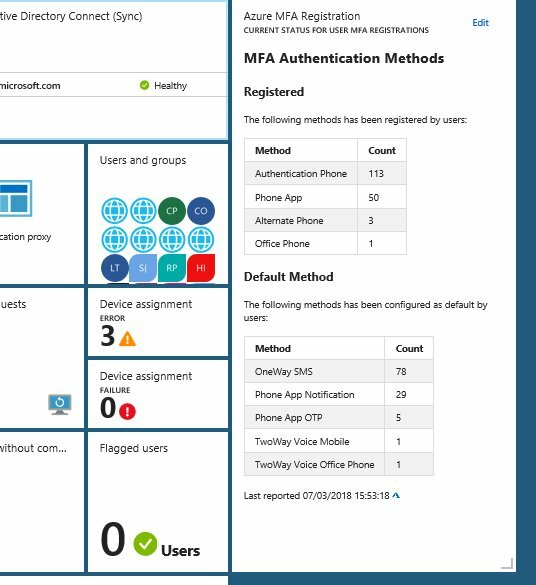 Often when I work with projects implementing Identity & Access, Conditional Access and Azure MFA, I wish I could have a dashboard to report on MFA registration, and be able to pin that to my EMS dashboard as shown above. 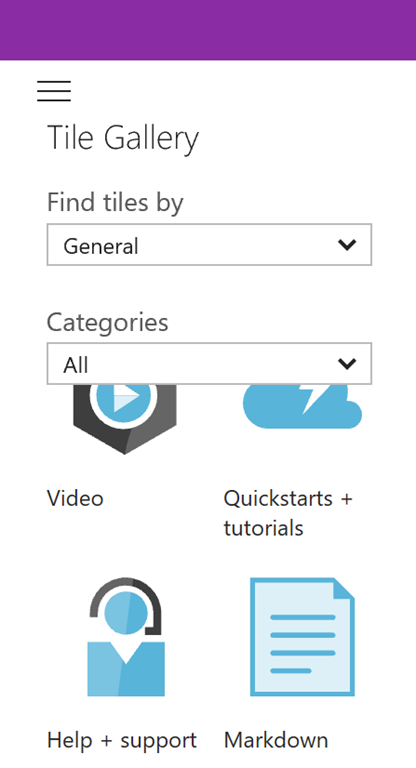 Now we need to fill that markdown tile with some real Azure AD MFA report data to report on. 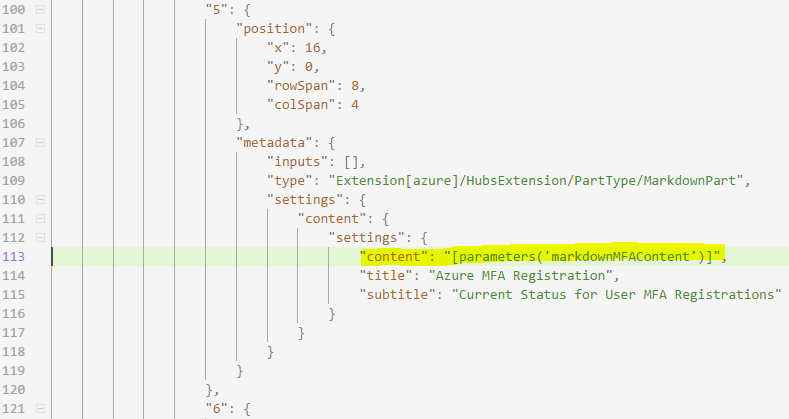 So the “bad” news is that we are reliant on running some Azure AD PowerShell commands for getting user details for MFA registration and methods. 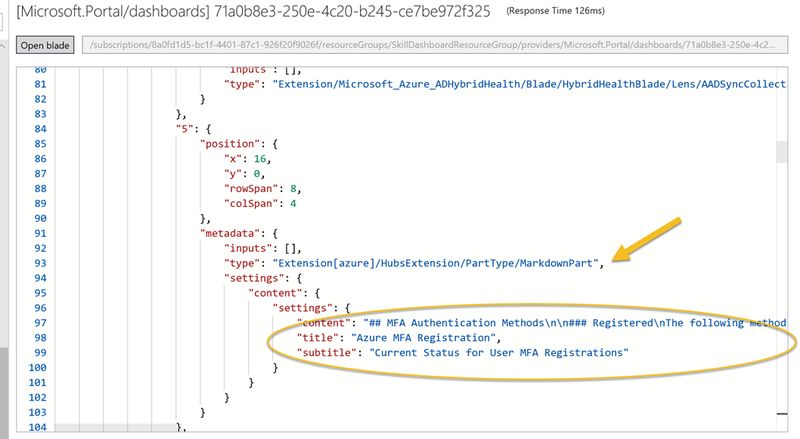 For now we are also reliant on the Azure AD v1 PowerShell (MSOnline) Module, as the new v2 AzureAD Module does not yet have any methods to get MFA authentication data. We cannot use the Microsoft Graph API either to get MFA user data, but I expect that to change in the future. 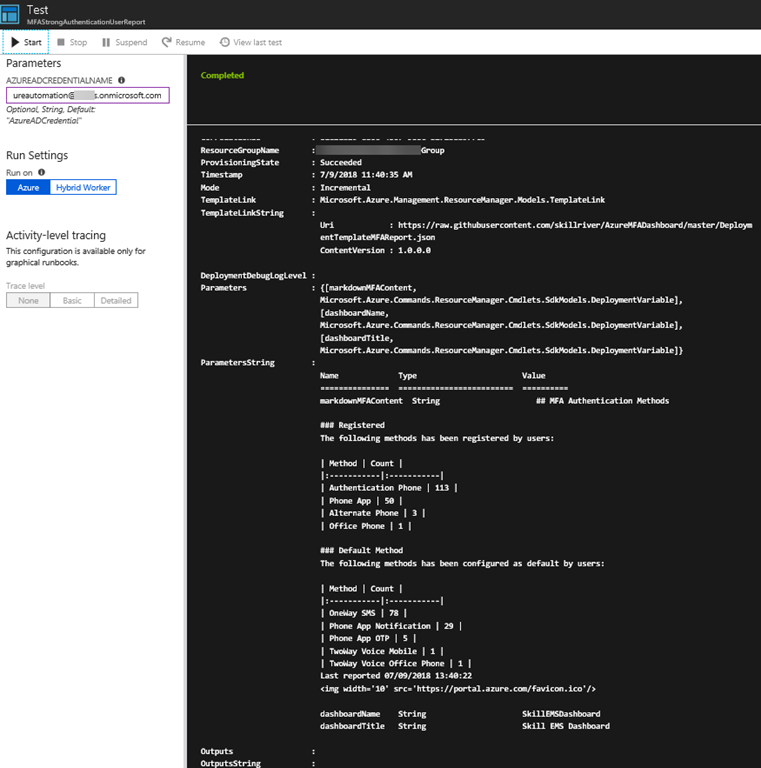 So lets look at the script I use, and after authenticating and connecting to Azure AD in my tenant with Connect-MSOLService, I will run the following commands to get details from each user where there has been configured one or more StrongAuthenticationMethods, and Group on those methods and save the results to a hash table. The results are stored in the $authMethodsRegistered object variable. Similarly I run the command once more, filtering on only showing the methods that are set to default for each user, and save to the $authMethodsDefault variable. Schedule the PowerShell script to run automatically. We can use Azure Automation for that. 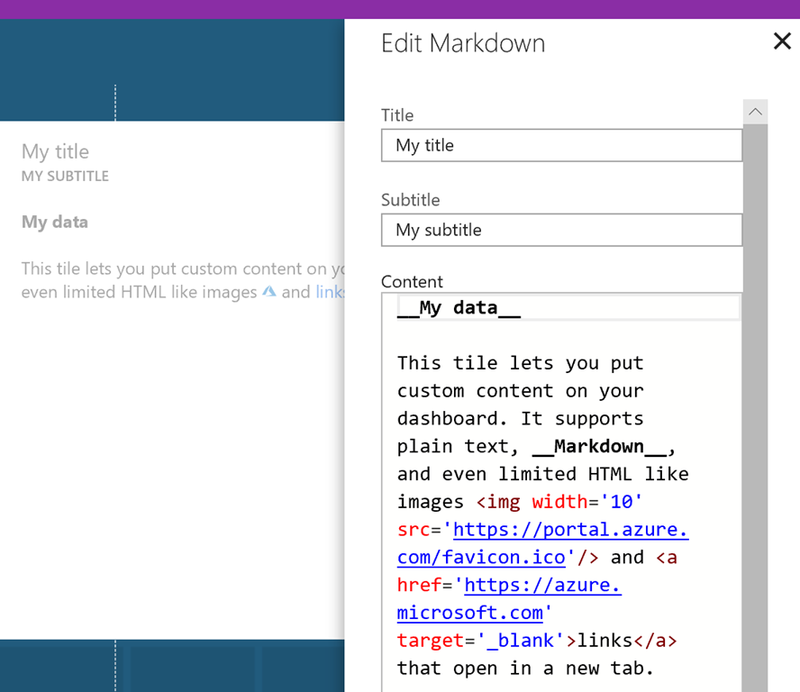 Programmatically change the markdown tile in the customized dashboard. 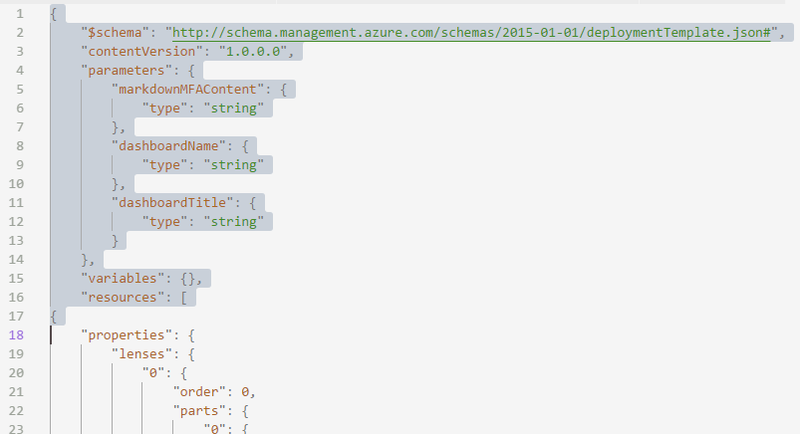 We can use Azure Resource Manager Rest API for that. Lets get into the Azure Automation solution first. To run a PowerShell script I will need to create a Runbook, and in that Runbook I need to authenticate to Azure AD. I can define a Credential Asset with a username and password for a global admin user, but I like to use the least privilege possible, and besides that all my global admins are either protected by Azure AD PIM and/or MFA, so that won’t work. I prefer to use a service principal whereever possible, but after testing extensively with Connect-MSOLService that is not supported either. So I tested with a dedicated Azure AD credential account, first by only adding the user to the Directory Readers role. 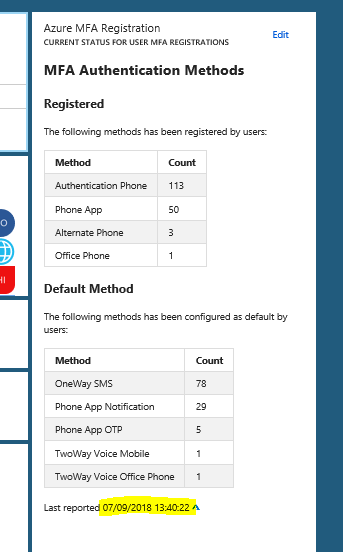 I was able to list all users with Get-MSOLUser, but not any StrongAuthentication info. Neither did it work with Security Readers. 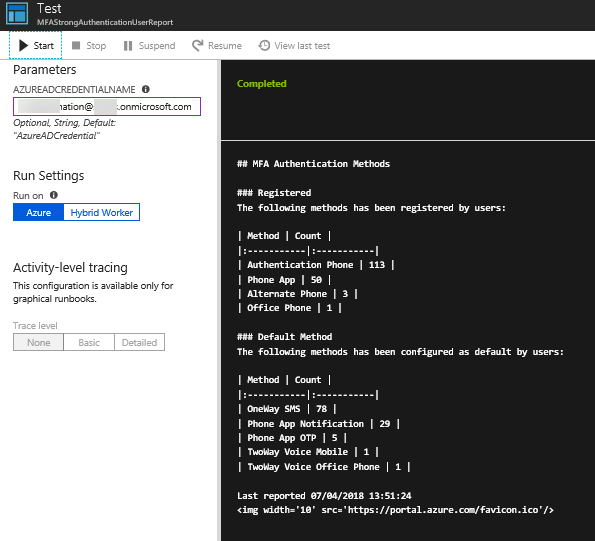 In the end I added the user account to User Administrator role in Azure AD, and I was successful getting StrongAuthentication methods. 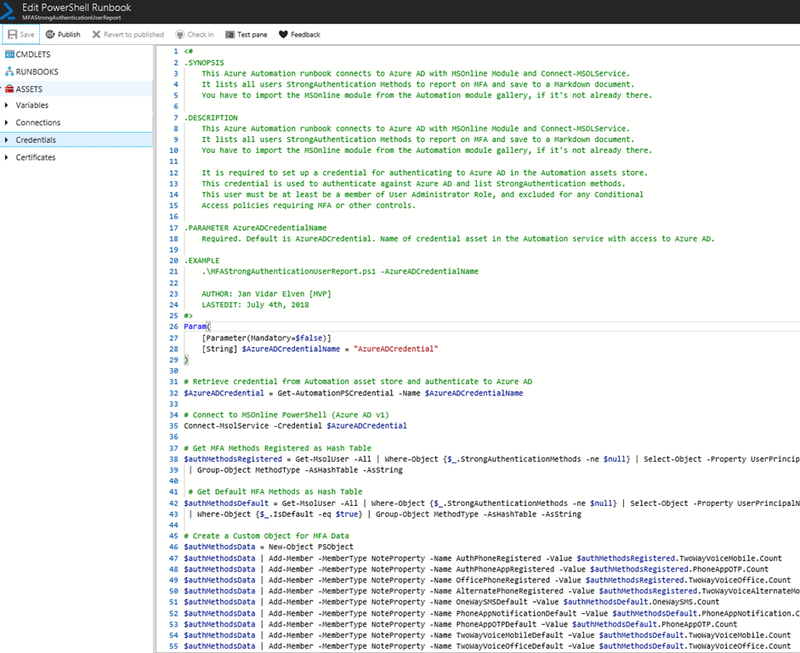 Now that we have a solution for running the PowerShell script and generating the markdown file, the next part is how to update that data in the custom dashboard. 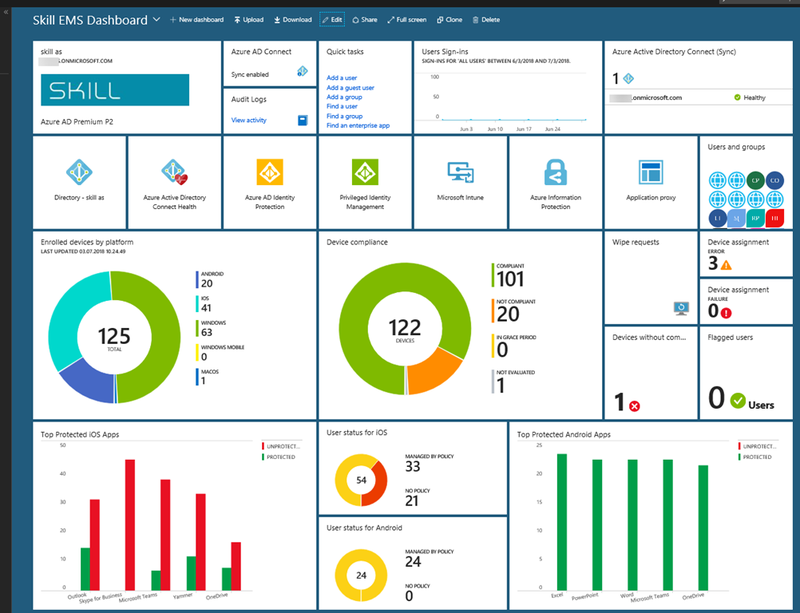 And for that we need to look into programatically changing Azure Portal dashboards. 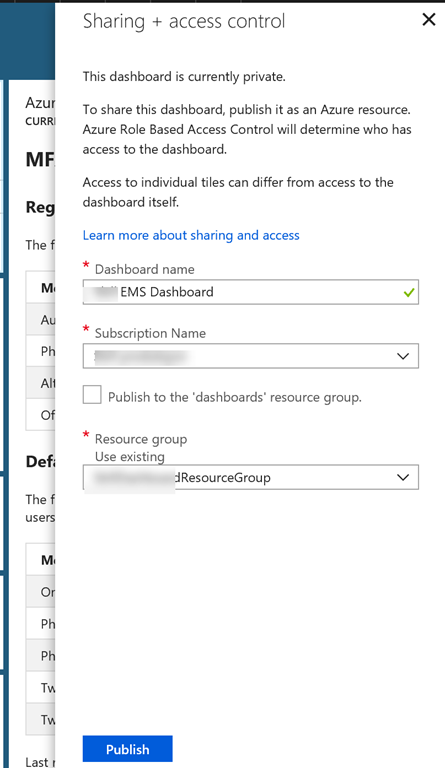 There is a good resource and starting point for that in this article: https://docs.microsoft.com/en-us/azure/azure-portal/azure-portal-dashboards-create-programmatically. So for next process now we need to copy this complete JSON definition containing all your tiles including the markdown tile. Locally on your computer, create a .json file in your favorite JSON editor, I use Visual Studio Code for this, and paste in the content. I have named my file DeploymentTemplateMFAReport.json. I have chosen to use 3 parameters, the markdown content itself, and name of the dashboard and the title of the dashboard. 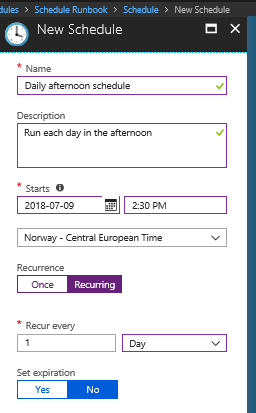 However, now that we can test the deployment, I want to schedule a deployment using Azure Automation, and I will continue on my previous runbook from before. 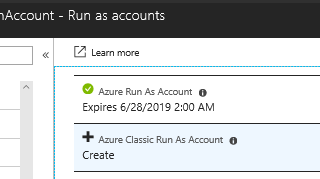 But first we need to set up some connections for authenticating to Azure and some variables. You can use any TemplateUri you want, for example from a more private source like a storage account blob etc. That concludes this lengthy blog post. The script will now run regularly and update my custom markdown tile with MFA report data. Here is the link to the PowerShell script used in my Azure Automation runbook, enjoy your MFA Reporting! This entry was posted in Automation, Azure, Azure AD, Azure Automation, Azure MFA, Enterprise Mobility + Security, PowerShell and tagged Azure AD, Azure Automation, Azure MFA, Dashboard, EMS, Json, Markdown, PowerShell on July 9, 2018 by Jan Vidar Elven.